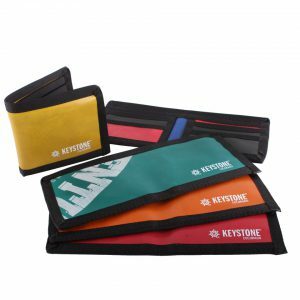 In an effort to divert waste from the landfill, Keystone Resorts partnered with Ecologic Designs to create wallets from old sledding hill tubes. When it came time to retire the colorful sledding hill tubes, Keystone Resorts chose to upcycle the tubing material instead of throwing it away. It was our pleasure to create custom wallets that were gifted to Keystone employees. To the surprise and delight of the Keystone employees’, they found their bonus checks waiting inside.